Sift flour into a bowl. Make a well in the centre. Whisk together the milk and eggs in a large bowl. Add 2 tablespoons of mixture, spread quickly to form a circle. Cook until bubbly, a little dry around the edges, and lightly browned on the bottom; turn and brown the other side. 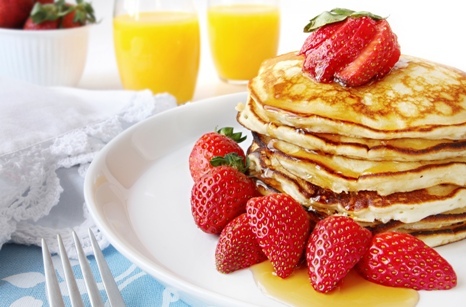 Serve these delicious pancakes with your favourite topping.